The Mancos Library brings the outdoors inside with a wall of glass windows overlooking the Mancos River. The Mancos Library functions as both a community resource and gathering place. Key features include a fireplace and seating area, computer desks, meeting room, outside patio, offices for the staff and a large children’s room. 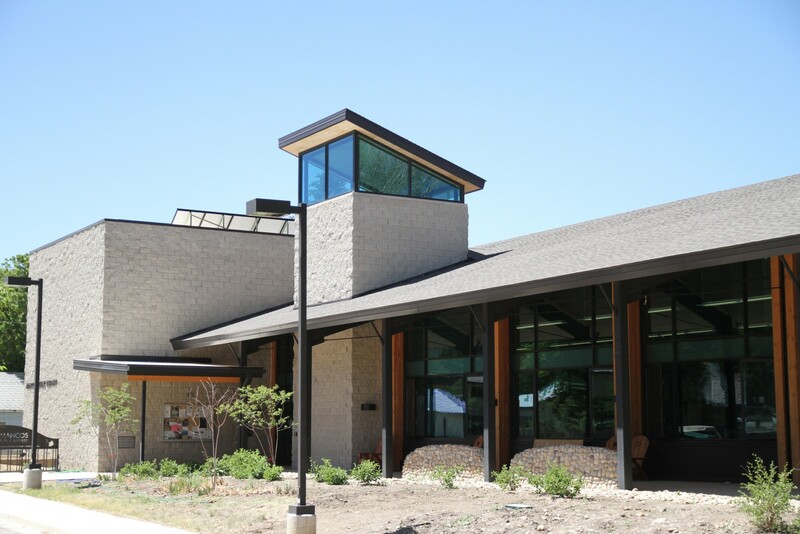 Originally designed as a LEED Certified building, the Mancos Library ultimately exceeded expectations and achieved LEED Gold thanks to the expertise of Dave Biggs, the Jaynes LEED consultant and Jaynes Superintendent, Jack Stuart. Some of the sustainable building elements included were: an energy efficient HVAC system design included a raised floor system along with the ductwork and electrical wiring; the installation of energy efficient SIPS panels – structural insulation panels – installed in the roof with the interior ceiling; and locally grown and harvested aspen wood interior ceiling finish; and the Jaynes woodshop milled cabinets made from compressed sunflower seeds and a ‘’paper stone’’ countertop.